HOLLISTER RED CROCHET ADJUSTABLE HALTER TOP - LINED - SIZE SMALL GREAT SHAPE. MIX & MATCH! MUDD JEGGING FIT LIGHT WASH JEANS LOT. HOLLISTER LACE SHIRT AND. SHIRT IS SIZE XS. XS Apt 9 lightweight, black button-up top. 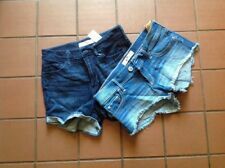 HOLLISTER & MORE JUNIORS COLLECTION OF SHORTS AND TOP SIZE MED. Lot of Women's Clothing ~Size Small~ Lots of nice things! 9 Pieces!!! Hollister gray top, JCREW black dress, Xhilaration off white cotton dress and flower top, Everly blue dress. Condition is Pre-owned. All in good condition. Please note Kimod romper need to have some areas repaired and the seams have come undone. All items come from a pet free and smoke free home. Sold as is. No returns. No exchanges. Shipped with USPS Priority Mail. Thanks for looking! 3 Various Pants Size Small. Hollister Boot Cut Jeans Size 00slim Pink Pajama Pants (softest pants I’ve ever felt) Size Small Aztec Leggings (Size runs small) Size Medium (FITS LIKE SMALL) Shipped with USPS Priority Mail. Lot of 8 shirt size great shape. Cold shoulder long sleeve three tees and more. 1 Hollister skirt - navy and white floral print. 2 pair of shorts size XS (black floral pair are a small, but fit like an XS). Women's Size Large Hollister Zip Up And Medium Yoga Leggings Outfit. Condition is great Pre-owned. Like new only worn once Shipped with USPS First Class Package. Three of them hollister the one with flowers not. Hollister Cream Halter Top (missing waist tie). Hollister and Lucky Brand. Women’s Lot Of 3 -Hollister navy blue casual short shorts tag size XS in good condition. Hollister medium wash blue skinny jeans tag size 1R 25/29 in fair condition. There is some puckering on the front of the legs, and Lucky Brand cut-off faded jean shorts tag size 0/25 in good condition. The Hollister jeans approximate inseam is 27”, the rise is about 7” and the waist is about 13.5”. The Lucky cut-off shorts have a 4” inseam, 7” rise and 14” waist, but they sit lower on the waist naturally. I hope these measurements help. Hollister Jean Cut off Capris Size 3 And SO Tank small. Condition is Pre-owned. Shipped with USPS First Class Package. Both in preowned condition. Tank has a small stain or something on it. See pucs. It may come out in wash. Jeans are in pre owned condition no issue other than fraying at cuffed bottoms. This lot consists of nothing but Hollister goodies. There are four pairs of short fun summer bottoms - the traditional khaki in a size 1, a playful beachy green and white striped bottoms in a size 1, a beautiful coral in a size 1 and a plaid that is perfect for any summer fun that comes your way which is in a size zero. In addition to the four shorts there are two pairs of Hollister jeans - one is a size 5R in vibrant yellow and there is also a pair of black low rise jean leggings in a size 3R, these will pair perfectly with a flirty top. Hollister Clothing Lot - 4 Items. Condition is Pre-owned. Shipped with USPS Priority Mail. Lot of 3 pre-owned Hollister shirts and sundress large in great condition. See all pictures for condition. One is Hollister, green, lacey at top and bottom, has a few dark tiny spots on back - see pictures. Womens Spring Lot Hollister Jeans Size 5 And Womens Shirts Size Small. Condition is Pre-owned. Shipped with USPS Priority Mail. Peach top is by lauren conrad. Tan top is from buckle daytrip. Smoke free home. Spring lot 3 pieces. Ok Teen Shirt 16 Pc Lot s/s, 3/4 & Sweatshirts-Med. Condition is Pre-owned. Shipped with USPS Priority Mail. Nine s/s shirts by: Hollister, Element,O’Neil, Hurley, Three sweatshirts: Billabong (2) RVCA Four 3/4 sleeve: Roxy, RVCA, Hurley, Hollister No holes or stains. From a non smoking home. JUNIORS Clothing Lot of HOLLISTER+American Eagle+Aeropostale+Dollhouse 10 ITEMS! Hollister Blue Denim Shorts Size 5/31" Waist (Hollister label on back worn-see picture). Hollister Sleeveless White Empire Waist Babydoll Shirt Size S . Hollister White Short Sleeve Crop Top w/White sequin Pocket Sz S.
Hollister white small stretchy. Nordstroms Sun and Shadow small purple stretchy. skirt small Sun & shadow by lily white - from Von Maurs Original price 34.00 - lined - zipper in back. Navy Eyelet Sundress - Size M. 22 California Graphic Tee - Size M. Blue Graphic Tee - Size M. Floral Ruffle Skirt - Size M.
Forever 21 Shorts Size Medium, see pictures & Hollister Medium Top, dark blue Feel free to contact me with any questions! Shipped with USPS First Class Package. ~Light wash distressed jeans Size 5 Long (27 waist, 35 length). ~Gray V-Neck-Size X-Small Soft & Stretchy. ~Navy blue 3/4 sleeve top size Small. ~Navy blue lounge/sweat pants size Small. ~Navy/white striped 3/4 sleeve top size Small. Condition is Pre-owned. Sweatshirt has no holes or stains. Minimal pilling. Floral is faded and entire front logo shows wear. Runs bigger in my opinion. Very soft and comfy. Pants have no holes. This is a Hollister outfit set that is perfect for back to school! Women Junior Clothing lot of 9 Mixed Brands Large/XL Guess Hollister & More. Includes: 4 bottoms (2 jeans, 1 leggings, 1 thin flowing pants); 1 sweater (thin); 1 long black dress; 3 tops (one could be used for a swim top). All good condition, no holes, stains or rips. IN GREAT CONDITION! (Certain countries may take longer). I have two small children, so it's not always possible. I AM MORE THAN WILLING TO WORK WITH YOU TO RESOLVE THE ISSUE! Two tanks in great condition. PayPal only. No returns. Will ship to US only. HOLLISTER SUPER SKINNY JEANS SIZE 1S. GOOD CONDITION. SEE PHOTOS.